¼ cup fresh lime juice. I’ve used lemon juice in a pinch and it works just as well. 1 Hawaiian chili pepper. Feel free to substitute the type of spice you like- red pepper flakes work well too. Put it all together in the blender for about 20 second or until smooth. Refrigerate. It may get hard/separate if you use a natural peanut butter, but that's totally normal. I typically double this recipe and make three jars of it to give to my family as well. Tell me what you’re planning to put this on or any other easy recipes you have in the comments! I'm always looking for quick meals and ingredients you can prep ahead of time. Recently, I heard a friend of mine say, “Being healthy is making the better choice most of the time.” Her perspective on health resonated with me because it works as an overarching philosophy of food rather than a regimented program. It provides a way to think about overall health rather than dictating an impossible quotient of fruits and vegetables and lean meats. We have a plethora of choices every time we open the refrigerator or walk past a row of tents at the farmers market. I try to make sure that most of the choices I make are good ones, choices that will make me feel good about what I’m putting in my mouth, the industries I support, and the energy I’ll feel afterwards. So no I'm not vegan or paleo or gluten free, I'm just a...conscious eater if that makes sense. For the most part, my body craves things that have come from the earth. My favorite foods are usually handed to me by a neighbor with too many tangelos, left on my doorstep by a friend who grows lettuce, or brought home by my dad after a fishing trip. I don’t eat too many things that come out of a package, for a variety of reasons, but when my friend said that health is simply making the better choice most of the time, I think she’s onto something. I travel a lot, I'm busy, I get hungry super fast so I like things that are EASY. That's why I wanted to start sharing some food ideas even though it's not something I post about too often. I’ve discovered that the easiest way to incorporate more vegetables and healthy foods into my diet is to drench them in some sort of yummy sauce. 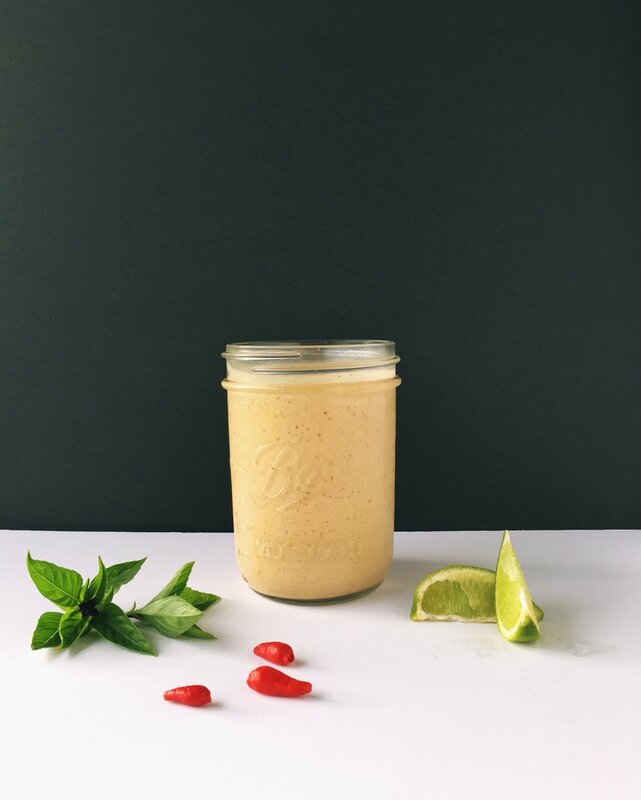 This spicy peanut sauce is one of my secrets to making the healthier choice most of the time because it makes everything taste good and feels more filling than a salad. For one of my go-to lunches, pictured here, I chop up a bunch of veggies, throw it on a bed of quinoa, and top it with peanut sauce. Tweak this however you like., with more lime juice or no spice, or adding something else to jazz this up.